Comfortable, user-friendly and agile, Power Chairs offer users of all ages from young children to seniors giving unprecedented freedom and mobility within the home and outdoors. Indoor power chairs are designed to be more compact and rounded so you can more easily manoeuvre tight corners and small spaces in the home. Outdoor power chairs are more sturdily built with extra-large, wide-tread tires and increased ground clearance so you can safely and smoothly traverse rougher outdoor surfaces. 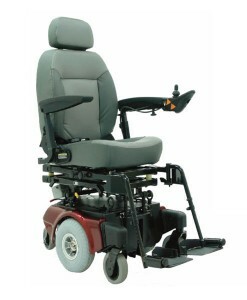 Independent Living Specialists offers you a wide range of fully customisable power chairs from leading manufacturers such as Permobil, Shoprider, Pride and Days Healthcare. All of our power chairs offer a number of arm, leg and seating adjustments to accommodate a wide range of users. Whether you are looking for a lightweight indoor power chair or a heavyweight outdoor model, we’ve got what you are looking for.